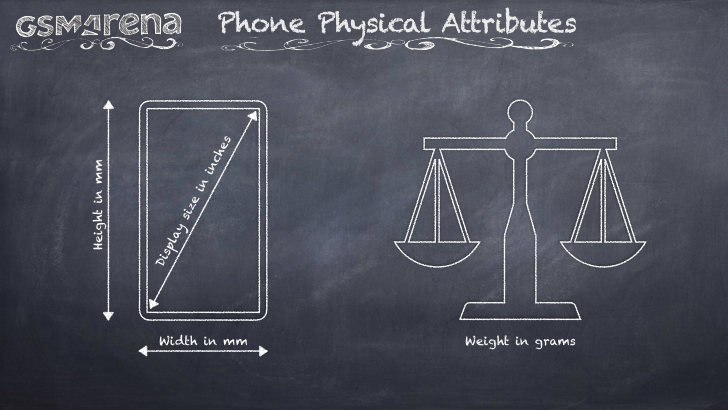 The physical attributes of a phone as we report it within our Phone Specifications page here at GSMArena. The size of the phone in format (H x L x W) and the volume of the phone where available. If the phone has a flip, it is measured with the flip closed. Lists the weight of the phone in grams. Sometimes the manufactures don't list the weight before the handset becomes available. As usual we try and update the field as frequently as needed. The industry standard way of representing display sizes is publishing their diagonal length in inches. The screen-to-body ratio is a measure which relates to the size of the screen bezels. The bigger the ratio, the smaller the bezels are, meaning the display takes up a larger area on the device's front. If you think that any information for the current phone is wrong or missing, please don't hesitate to contact us.